Estimating or measuring soil texture provides valuable information about soil properties affecting crop and pasture growth. Soil texture affects the movement and availability of air, nutrients and water in a soil. 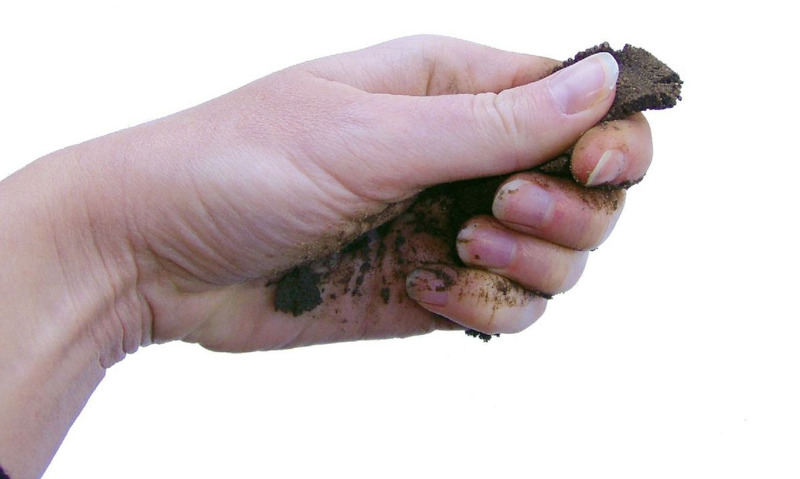 A simple and quick measure of soil texture is the way a soil feels when manipulated by hand. Soil texture is an estimate of the amount of sand, silt and clay particles present in the soil. It is an inherent property of the soil and cannot be changed by normal agronomic practices. Many physical characteristics of the soil depend on texture, and the clay content is very important. Soil texture affects drainage and structure, which in turn affect how plants will grow in the soil. The clay and organic matter help to bind soil particles together, forming stable aggregates, which are an indicator of good soil structure: good soil drainage, root and seedling penetration, and aeration. Use a 2-millimetre (mm) sieve to remove stones and gravel, and break down lumps in the soil, making it easier to work with. If your soil is damp, you will need to dry it before sieving. To dry, place about 1 kilogram of broken-up soil in an oven at 150°C for 2–4 hours. Make a visual estimate of the percentage of stones and gravel in the soil from step 1. This helps if you plan to estimate the plant available water capacity of the soil. To fit comfortably in the palm of your hand. Add enough water to make a bolus or ball (Figure 1). Knead the bolus for 1–2 minutes, adding more water or soil until it just stops sticking to your fingers. Note how the soil feels when kneading it: gritty (sandy), silky (silty) or plastic/sticky (clay). If you can’t make a bolus, the soil is very sandy. Gently press out the soil between your thumb and index finger to form a hanging ribbon. The ribbon should only be 2–3mm thick. The more clay you have in your soil, the longer your ribbon will be (Figures 2 and 3). Use information in Table 1 to more accurately identify your soil’s texture. Field texturing is not as accurate as laboratory testing for particle size: field textures are influenced by organic matter, different clay minerals, the sodicity (i.e. the proportion of sodium on the cation exchange sites of the clay) and the amount of calcium carbonate (lime) present. In general, field texture is a reasonable guide to soil behaviour for agricultural management. More information to help you texture a soil sample is given in Tables 1 and 2.